In 2016, Thomas Mullen delivered one of the crime novels of the year with Darktown. That book told the story of the first Black policemen in Atlanta, a force established in the years following World War II. Darktown showed the institutionalised racism that sat behind and around that decision. The group of eight policemen were set up in a basement of the YMCA with no vehicles and if they wanted to arrest someone they had to call the white police to do it. They were only allowed to patrol the predominantly black areas of town and while they were feted for the steps they were taking they were also feared in their own community. Darktown was in other respects a straight down the line procedural in which two of the black policemen and one white policeman work a murder case from different angles. Lightning Men picks up a couple of years after the events of Darktown. Like its predecessor it focusses mainly on the black police partners of Boggs and Smith and their former co-conspirator Deny Rakestraw but it also ranges across a broader cross section of characters. Each of the three main characters have their own problems to work through when the book opens. Boggs wants to marry a local woman with a child who his family think is beneath him and is shocked when the father of her child returns to Atlanta after a stint in prison. Rakestraw is dealing with his brother, a Klu Klux Klansman who gets himself involved in the beating of a white man. At the same time all (and Mullen) are dealing with the social changes affecting their city – the movement of black families into white neighbourhoods, an issue touched on in the last book, becomes a centrepiece of this narrative. The Klu Klux Klan is rising again, its membership including politicians and Rakestraw’s fellow policemen. Boggs and Smith are trying to stem the tide of drugs and alcohol flowing into their neighbourhoods, supported by corrupt, white policemen. 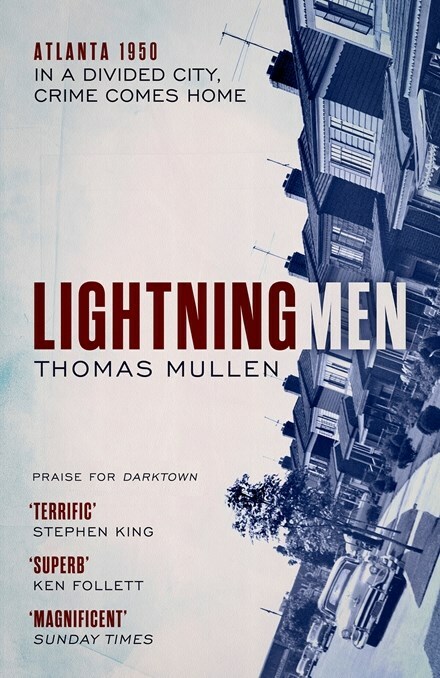 While there is plenty of procedure and some mystery and skullduggery in Lightning Men, this is less of a procedural and mystery than Darktown. That said, Mullen still effectively uses crime genre and procedural elements as the gateway to a complex social picture of a city in transition and the pressures and history underlying some of America’s present day issues. Lightning Men is a great sequel to Darktown and the good news it that it sets the characters up for at least one more book.